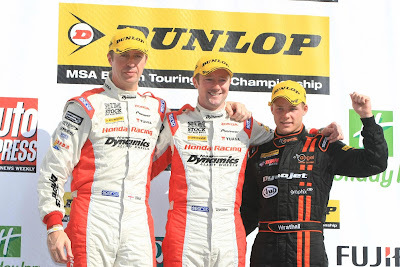 Jason Plato, Gordon Shedden and, for the first time in his career, James Nash shared the victories in yesterday’s (Sun 18 Sept) three Dunlop MSA British Touring Car Championship races at Rockingham. Leaving the Northamptonshire venue, Scotsman Shedden and his Honda team-mate, Worcestershire’s Matt Neal, are dramatically tied for the championship lead as the BTCC now heads to the world-famous Brands Hatch Grand Prix circuit in Kent for the penultimate three races of its nail-biting 2011 season on 1-2 October. Starting from pole position in his Silverline Chevrolet Cruze, reigning Champion Plato from Oxford led the opening race all the way to record his sixth win of the season. Widnes’s Paul O’Neill, also driving a Cruze for the GoMobileUK.com with tech-speed team, finished second ahead of Preston racer Frank Wrathall, third in his Dynojet Toyota Avensis. Neal was fourth and Shedden sixth. As a result, Neal edged past Shedden to lead the championship by two points. Shedden then immediately struck back with his fifth win of the season in his Honda Racing Team Civic in race two ahead of Wrathall and Neal. 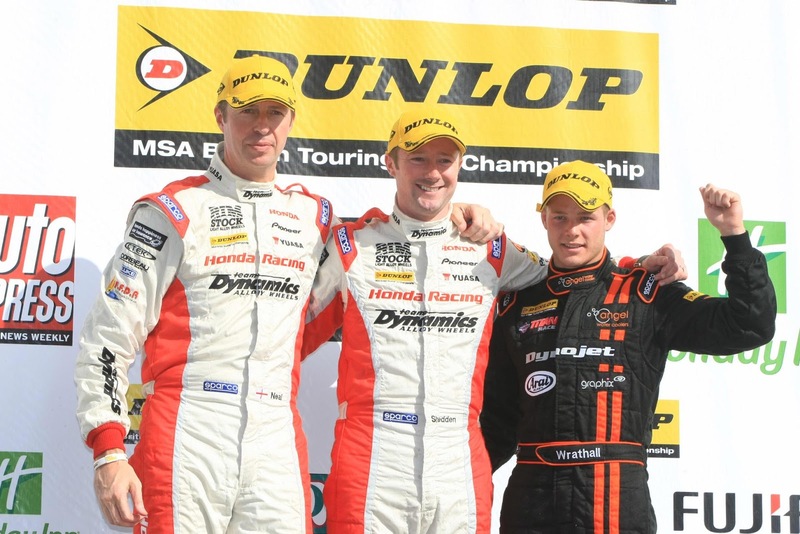 This meant Shedden now held a five-point championship lead from Neal. Notably, Wrathall’s second place was the best result to date for a car built to the BTCC’s latest Next Generation Touring Car regulations. 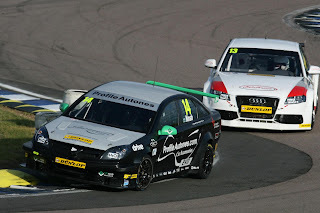 Race three saw Nash, from nearby Newport Pagnell, achieve the first win of his BTCC career as his 888 Racing with Collins Contractors Vauxhall Vectra held off Pershore rival Rob Austin’s NGTC-spec Rob Austin Racing Audi A4. Hampshire’s Robert Collard took third in his WSR BMW. Nash’s win, incidentally, meant he became the eighth different winner so far this season and ensured the famed 888 team’s record of at least one victory every season since 1998 remains in tact. 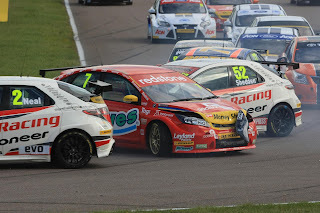 Behind, Neal took sixth to draw level on points with Shedden who finished well down after his Civic was damaged in a collision with a rival car. As a result, Honda duo Neal and Shedden are now joint first at the top of the table from Plato in third, the Chevrolet driver having achieved the day’s highest cumulative score thanks to his race one win and then fourth and fifth place finishes. Meanwhile Nash has also moved past Mat Jackson into the lead of Independents Trophy. For the second event in a row, Jackson, who had led the outright standings just two rounds ago, again failed to score in any of yesterday’s races. Similarly, Nash’s 888/Collins outfit has moved past Jackson’s Airwaves Racing squad to head the Independent Teams Trophy. Honda/Dynamics and the Honda Racing Team remain comfortable leaders of the Manufacturer/Constructor and HiQ Teams championships respectively. 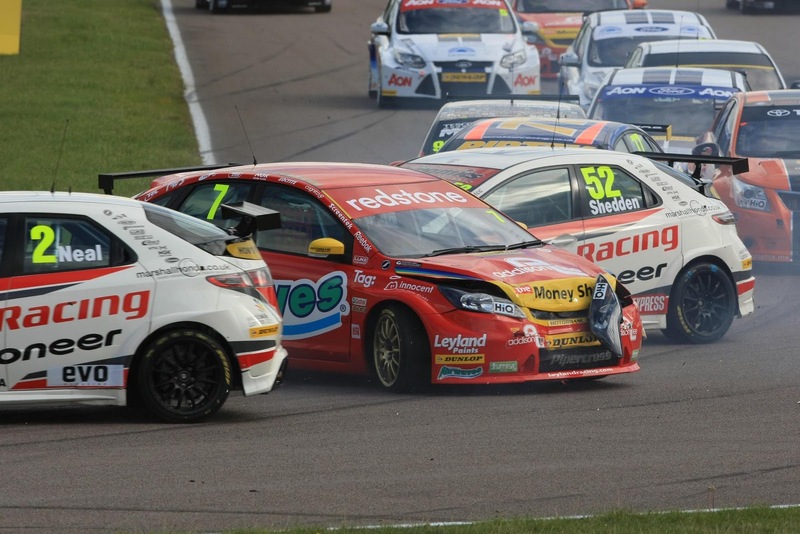 Elsewhere, a number of drivers were punished by officials at Rockingham for a variety of incidents, namely: Jason Plato and Matt Neal, both fined £1000, given three penalty points on their competition licences and handed a six-place grid penalty, suspended for the balance of the 2011 season for on and off-track incidents during qualifying; Andy Neate, fined £1500 and given three penalty points for an on-track incident in race one and subsequent abusive language; Alex MacDowall, Paul O’Neill and Nick Foster, all given two penalty points and official reprimands for on-track incidents in races one, two and three respectively. In addition, Tom Boardman was also fined £1000, given three penalty points and a six-place grid penalty for today’s first race for an on-track incident in the previous round at Knockhill.